The Shaws believe this difficult journey was a blessing in disguise. They not only made it through the crisis, but are stronger because of it. Elizabeth Shaw was new to parenthood when she noticed that her three-month-old son, Noah, wasn't focusing his eyes on anyone or anything. Noah's four-month checkup was just around the corner so during his regular appointment, Elizabeth urged Noah's pediatrician to examine his eyes. Elizabeth's instincts proved to be on target when later that day Noah was diagnosed with bilateral retinoblastoma, a rapidly developing cancer that grows in the cells of both retinas. 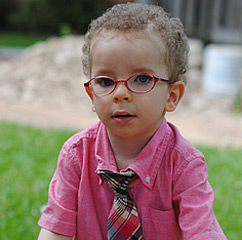 Noah underwent four months of intense chemotherapy without much success. His right eye continued to worsen and developed new tumors. It was decided that the best option for his overall health was to completely remove his right eye. The Shaws were reassured they made the right decision when they learned that more "seeding" (beginning of additional new tumor growth) in the right eye had been discovered. In the midst of these tribulations, the Shaws found a new insight on life. "Noah's illness taught us to savor the preciousness in life," said Elizabeth. Noah's final radiation treatment was in February 2009, only three months before his first birthday. The Shaws believe this difficult journey was a blessing in disguise. They not only made it through the crisis, but are stronger because of it. Elizabeth and her husband, Bryan, started a blog as a way to cope with their son's cancer and to keep loved ones informed of his progress. The Shaws continue to update their family and friends with their blog after every three month check-up. ";We truly feel like the worst is behind us at this point," according to Elizabeth. Currently, Noah is enrolled in occupational therapy, speech therapy, physical therapy and hippotherapy (a form of therapy in which the therapist uses the movements of a horse to provide carefully graded sensory and motor input) to offset the cancer's effects. The toddler's busy schedule doesn't stop there. He's shown an affinity for music and takes piano lessons to work on his fine motor skills and hearing. In his spare time, Noah loves to paint, color and watch his pet tarantula. Just shy of three years old, Noah doesn't fully understand what all his little body has endured but surviving cancer has positively and permanently impacted the entire Shaw family.